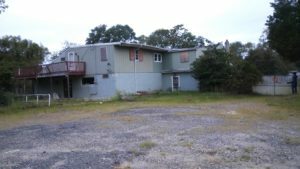 ATCO, NJ PROPERTY – ONLY $85,000 CASH This property is 4,910 sqft and rests on 3.61 acres of open land in a well developed neighborhood. While it was once a popular town night club on the main level with a 4 bedroom apartment above, by using your imagination, this property can be almost anything you could imagine. CALL, TEXT OR EMAIL TODAY FOR MORE INFORMATION AND TO SCHEDULE A VISIT. 856-528-9212 SERIOUS BUYERS ONLY!!! Buyer responsible for all necessary inspections, permits, etc. Copyright © 2017 Property Solutions Unlimited LLC. All Rights Reserved.